With new hop varities appearing left, right, and centre, it can be difficult to navigate your way through the growing tide of green. Lucky for us, we live slap bang in the middle of the Hopshires. Don’t worry if you’ve got no idea where the hell ‘Hopshire’ is. 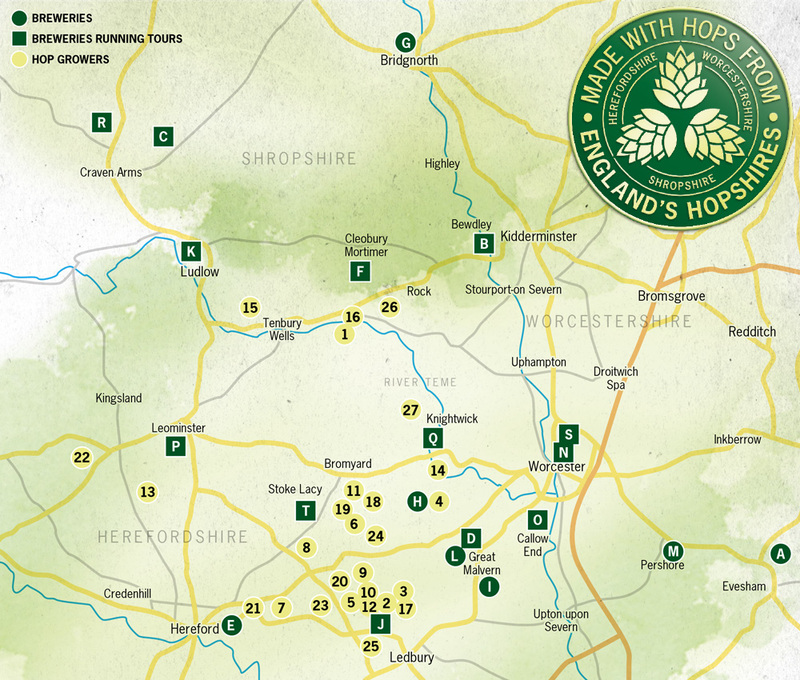 It’s not actually a specific place, it’s a term used to describe the region of Worcestershire and Herefordshire to show which hops are grown within these areas. As brewers of traditional English Ale we value hop quality above all else, our focus is to source our hops and malt from local surrounding areas. Lucky for us, one of the oldest established Hop Merchants originates right next to us in the city of Worcester. Charles Faram, we’re looking at you. Established in 1859, these guys and gals have over 150 years of brewing, trading, and cultivating knowledge. Our chosen supplier of hops and malt, they supply us with one of the most widely known hops ‘Fuggles’. Hops had become a bit like apples before the craft beer revolution - many varieties which had been around for centuries died out due to lack of interest and funding. Just like the Golden Delicious apple stormed supermarket shelves, a few popular hops took over the brewing world as major labels only brewed a couple of beers in mass quantities. However, times have changed, and what began as a hop revival has turned into a revolution. Fuggles hops have been around almost as long as Charles Faram; first cultivated in 1861, Fuggles became the dominant hop variety in England for over 70 years. They have a delicate, minty, grassy, slightly floral aroma. They are often combined with the hop Golding, which gives the classic rounded, full-bodied flavour of an English Ale. We use it in our beer Shindig - to give it a clean, refreshing flavour. Give it a try and tell us what you think. Progress was originally created to be a low-cost alternative for Fuggle hops. It’s been around since the 1950s and has a sweet, but slightly bitter flavour. It has similar aromas to Fuggle with notes of grass, mint, and some earthiness. Progress creates full bodied, well rounded brews which makes it a great hop for bittering. Goldings hops have been grown in England for over 100 years, and as such form the basis of many well-known recipes. Goldings are also popular in the USA after being introduced in 1995. They produce gentle aromas which tend to be more floral, earthy and slightly spicy, and give sweet, smooth, honey-like characteristics when used in bittering. The first of it’s kind, First Gold is a hedgerow hop that was commercially released in 1996. A hedgerow hop is one that typically doesn’t grow as high as conventional varieties. First Gold is a Goldings-like hop which is suitable for bittering and aroma additions. It has a sweet, orange citrus aroma and spicy notes. It’s a versatile hop and it’s flavours are of marmalade, geranium, magnolia, and tend to be on the more sweet, floral side. Challenger hops are an excellent all-round variety; they were first introduced by Wye College in 1972. They are often used as a bittering hop as they provide a refreshing, full-bodied, rounded bitterness. However, they can also be used as a late hop as they have floral characteristics, with some notes of spice, cedar, and green tea, when used like this they give a very crisp and fruity character. A map of the Hopshires, showing local breweries and hop gardens.